Big Science is a central part of the U.K. economy. The Knowledge Economy, with science and technology as the tangible drivers, is critical to economic success. But for many in regeneration, Big Science remains a mystery, especially at the level of the ‘new localism’. Here we consider regeneration strategies, science policy and the synergy of science and economies at regional and local level. The Golden Triangle and the Holy Grail of the Triple Helix……. Modern science is massive. That’s why it’s often referred to as Big Science. The costs (and sometimes the rewards), the numbers of people involved, the management and resource levels and the skills required – all are very, very high. And yet… to most of us, science remains effectively invisible. · Big Science, like (say) public motorways, is paid for by money from very high up the funding chain. Decisions on funding are made at national (and international) level by people of whom almost no-one outside their particular sphere of influence has heard. But unlike motorways, which we can at least see, we rarely encounter Big Science directly in our daily lives. It therefore remains off our radar. · Most of us know very little about what science is ‘for’ and how it works. The numbers of school children studying science in their later, elective years is still falling, as are numbers of degree students. We are not therefore conscious of the ways in which science gives rise to things with which we are familiar, from shampoo to plastics to machines. · Whether science and science-related practitioners see themselves as having a linked core interest or not, they nonetheless usually believe that their work has little or nothing to do with the wider worlds of public involvement and politics. There may be issues arising from science and technology (which I shall refer to from now on as SciTech) for others to address around economics or ethics, but what happens in the labs is the main concern – and this is observed by very few. · Science is likewise not a vote-catcher. It is unusual for the electorate to invest much time and energy pursuing issues around this theme; which means that in general neither the media nor politicians spend much time considering it either. Returning then to the comparison with motorways, both may be very expensive, but Big Science is almost always off limits for the public at large – it is often located within universities or on special campuses of some sort, very much less visible than a large road. Does Big Science need to be visible? But why should invisibility matter? After all, we may well not think about science very much, but every region of the United Kingdom has its own science and technology parks, where scientists and technologists rub shoulders with business and commercial people. These parks may not be in our thoughts a great deal, but they create jobs and inward investment and are often key parts of regeneration strategies. In general we do not see the vaccine research laboratories, the synchrotrons, or the materials science analysts at work. But so what if they’re not ‘visible’? Does it really matter? Answers to this question can be given at a number of levels; but in all cases the answer is Yes, invisibility has negative impacts and does indeed matter. · opportunities to procure regeneration, at both practical and strategic levels. Some of the follow-on repercussions of this invisibility are obvious; others are less so. And the consequences are likewise different for different terrains. The ‘hothouse’ of the Golden Triangle [roughly, that area covering London, Oxbridge and the M4 / 5 corridors] is probably less directly vulnerable than, say, a Science Park in Northern England. But it is at least possible that every part of the high level Knowledge Economy is disadvantaged by the inequity and uneven distribution of synergies between ‘hothouse’ and more isolated facilities. The former is becoming stressed, the latter need more support and development of capacity. It is now accepted that it is the synthesis of Universities, Industry and Government – the ‘Triple Helix’ – which brings about serious SciTech innovation. This Triple Helix, as we shall see, is in effect the Holy Grail to a vibrant knowledge-led twenty first century economy. The world wide web may keep researchers and others in touch, but there is nothing like direct involvement from the big investment players to secure scientific progress in a given location. In other words, ad hoc development of SciTech facilities will take a local economy so far, but not far enough. Only strategic planning on a grand scale, and by with all parties working together, will however produce the sort of results which make a significant difference. And that means involvement at the highest levels of decision-making. A corollary of this scenario is that people at all points on the decision-making ‘chain’ need to be aware of the complexities of SciTech. Again, this is more likely to be the case in the Golden Triangle, than in our off-the-map Northern Science Park. When a lot of local people are employed in SciTech jobs at the highest levels, as in the Golden Triangle, awareness of science and technology will be far greater than when this is not the case. Dispersed discreet locations without significant business links are on their own unlikely to change the local business or political perspective about what is important. – what does this mean for us and our knowledge economies? 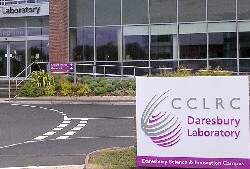 A case in point here is the Daresbury Laboratory near Warrington, in the North West of England. This establishment, much of the work of which is as a world leader in the field of high energy physics, had been in existence for some decades, collaborating with the University of Liverpool and several other higher education and research laboratories. 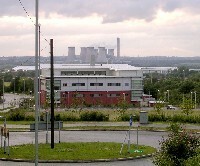 By the mid-nineteen nineties, however, Daresbury had become something of an island unto itself, still conducting worthy international research but effectively disconnected from its locality, the local business / industrial base, and, critically, the political and administrative decision-making process. The result of this disconnection was that the warning flags were not hoisted around the North West when the Rutherford Appleton Laboratory, based in the Golden Triangle, decided to bid against Daresbury to the CCLRC (Central Council of the Laboratories of the Research Councils) to construct and operate DIAMOND, the planned third generation synchrotron – an intense light source which propels sub-atomic particles at extraordinary speeds in order to effect particle collisions for academic research and industrial / medical purposes. By the approach of the Millennium it was becoming clear that Daresbury’s initial understanding about where the new light source would be placed were at best optimistic, although by then numbers of local and national politicians and others had also become involved in Daresbury’s attempt to secure the research funds which it had assumed were coming to the North West. Similarly, and too late in the day, the North West Development Agency recognised that this was not simply a matter of ruffled feathers in academia, bur rather a matter of serious consequence for the whole of the region. Conferences were held, industrial and business liaisons established, plans proposed for collaboration with a number of the North West’s leading universities and hospitals – from which was later to be developed a proposal for a much more broadly-based programme of academic and applied science (CASIM). It was however too late to secure DIAMOND, and the contract went to the Rutherford Appleton Laboratory, taking with it some of Daresbury’s most highly skilled technicians. An emerging perception of how Big Science fits the national economy. It slowly transpired, however, that all was not lost when Daresbury had to concede DIAMOND (and thus much of its future funding) to Rutherford Appleton. The North West campaign to retain support for the Laboratory had by then gained considerable momentum. Regeneration and strategic planners across the region had begun to realise that here was a facility which no-one could afford to see as an ivory tower. Interestingly, the collapse of Daresbury’s expectations at this time also proved to be a watershed for national governmental understandings of the interaction between Big Science and the economy, nationally and regionally. The model in use at the time of the DIAMOND decision was essentially that of straightforward competition. It had hitherto been accepted – though perhaps largely on face-value – that the physical location of Big Science facilities should be brokered only on the basis of the preferences of direct partners and funders (the Wellcome Foundation, a massive funding body, was particularly vociferous about supporting only Rutherford Appleton – already, through long-standing connections between key Oxbridge players, a Wellcome partner in a number of activities). The North West media outcry about losing DIAMOND also coincided with the beginnings of a repositioning nationally about how Big Science was to be taken forward. It was slowly dawning on national decision-makers that, whilst the quality of the science itself had to be (by a very long way) the lead criterion for the allocation of funding at this level, the project evaluation playing field was nonetheless not entirely even. For instance, whilst it might perhaps be valid to suggest that more immediate business and industrial benefit might accrue from investment in the South East, the ultimate benefit of funding to the North West might be greater in terms of its impact on the regional economy. Similarly, scientists of the very highest order might in general have been found in greater numbers in the Golden Triangle, this was not an excuse for failing to invest in research and development in the universities of the North West. As has subsequently been demonstrated, top scientists are willing in significant numbers to follow the most challenging science, wherever it is located – especially if the costs of housing etc are lower, as well. And so we come to the present day story of Daresbury Laboratory. Daresbury has attracted a number of new and very senior staff to support outstanding colleagues based in North West universities, it has connected with business, industrial, strategic and political interests throughout the region, and it has established a fast-growing SciTech park led by major NW companies. 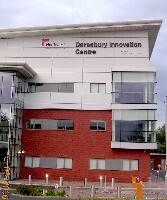 Not every part of CASIM proved to be deliverable (the medical applications especially proved difficult, perhaps of the way that hospital-based research is supported); but Daresbury most importantly has secured the Fourth Generation Light Source programme, which will make it the world leader in this field. The Daresbury saga is salutary in a number of respects. First, it demonstrates the increasingly competitive nature of SciTech, and especially Big Science, in modern economies. Second, it shows that all parts of the Triple Helix – collaboration between universities, industries and the state – are essential in order to secure the sort of funding required for present day Big Science programmes. And third, it illustrates very well the need for scientists, politicians and other public and private sector decision-makers at regional and sub-regional / local levels to remain alert, if they are to ensure adequate funding and other strategic support for prestigious and regenerationally effective SciTech enterprises. There are therefore important lessons to be learned at regional and sub-regional levels. One of the most defining aspects of Big Science is its internationalism. In the U.K. almost all Big Science projects will have a European aspect, probably under one of the European Union Frameworks for Science (we are currently on our 6th, and the 7th is under negotiation); and most projects will also be attached in some respects to laboratories such as, for instance, those at M.I.T. or CalTech in the United States. This huge span of expertise and personnel arises largely organically in the first instance. Most serious scientists and technologists barely recognise national boundaries in their academic and applied work. Venture capital and the very high level knowledge economy have an operational syntax all of their own. These facts of scientific life put notions of the ‘New Localism’ and of City Regions in a different light. They are, to be blunt, too small as areas and populations on their own to be realistic players in the battle for Big Science. To illustrate this, the European Union recognises a number of population bases – NUTS, or Nomenclature of Territorial Units for Statistics – of which the most commonly used in NUTS 1, or areas containing 3 – 7 million people. NUTS 1 areas are the size of major administrative units in most European countries; in fact, about the size of each of the English regions, and of Scotland and Wales respectively. City Regions are usually NUTS 2 size – 0.8 – 3 million people, and outside capital cities do not generally in most of Europe have autonomous governance. Given that the annual budget of connected major Big Science programmes can approach that of the government of a small European country it is obviously not possible for them to operate at, say, the city region level . They require massive financial backing in terms of regional infrastructural support and they require equally massive buy-in from business and industry. And of course they need very significant numbers of available in-house expertise from local universities and other research institutions. No non-capital town or city on its own is likely to be able to provide the levels of support required to secure significant Big Science onto its patch. The North West Development Agency and / or the Northern Way, for instance, can take full part as lead players; individual sub-regional cities, however otherwise important, can only be bit players on the Big Science stage. The message of Big Science is not entirely encouraging for those who eschew regionalism and seek preeminence for city-regions – not least because in reality most major cities simply don’t have the actual physical space, let alone the budget, to secure Big Science for themselves alone. This is one scenario where, whatever applies elsewhere, only a shared and regional approach, or more, will do. For the U.K. at least this means that, if Big Science growth is to occur outside the Golden Triangle, the Holy Grail of the Triple Helix must be pursued by everyone, regardless of inter-city or inter-university rivalries or of otherwise competing interests between industries and businesses. National Government must develop a policy on regional science, and regions and sub-regions must likewise respond to the opportunities such a policy would bring.